I gave you my thoughts on the Vichy Idéal Body serum/milk and today you can read my review on the Vichy Pureté Thermale Micellar Water. I must say I was a bit apprehensive at first. This micellar water looked like a lotion, so how could this clean my face thoroughly ? Well, it can. Believe me. The first few times, I used the product in the evening to get my make-up off. I could get it all off without any problems, even my mascara, but I had to use several cotton pads of product to get it all off. I thought that was a bit of a waste. So at night I stick with my good old Perfectly Clean from Estée Lauder (of which you can read a review here). I am using this miccelar water in the mornings now, after my shower. It cleanses and refreshes my skin before I start my make-up routine. The Pureté Thermale micellar water has a neutral smell. It feels very comfortable using it. My skin doesn’t feel itchy or dry as it does after using an ordinary lotion which can make my skin feel really dehydrated. My skin feels super soft after using this product. It’s a bonus that it can be used on your whole face, that means, including your eyes ! It makes cleansing so much faster and easier. It also makes the product perfect for a holiday as you only need one product for your face and eyes and you don’t need an extra lotion. I will be going on a weekend break soon and instead of packing several things to cleanse my face I will only take this micellar water which makes packing and unpacking just a bit faster ! 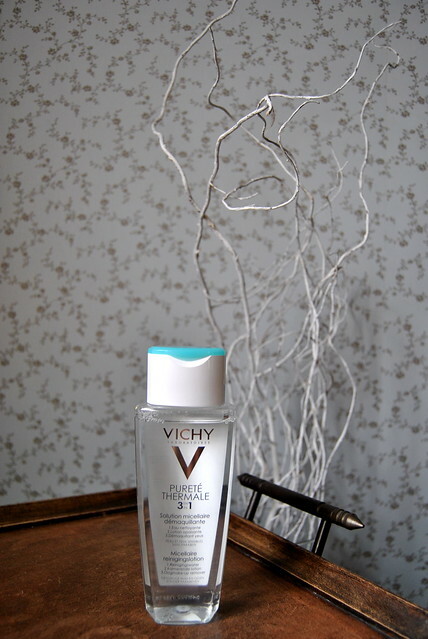 The Vichy Pureté Thermale micellar water is an excellent product. I won’t ditch my Perfectly Clean from Estée Lauder, which I will keep on using in the evenings. But I will use this micellar product in the mornings and on holiday !